This is an original copy of The Adventures of Obadiah Oldbuck by Rodolphe Töpffer circa 1842. 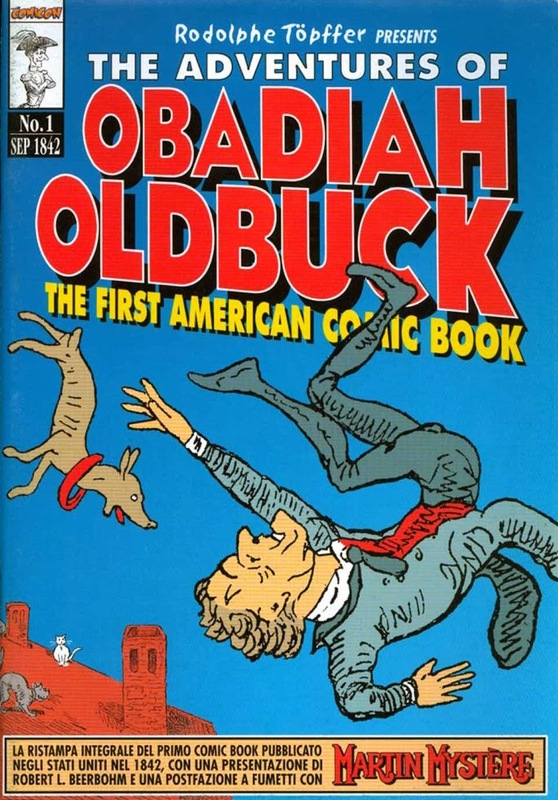 It's considered the first comic book published in America. There's one on display at the Billy Ireland Library and Museum, and they have a copy at Columbia University as well. This particular one is actually up for auction on eBay with a current asking price of $12,500. So I'm wondering why, in this Golden Age of reprints, no one has done a nice, high-quality reproduction. Granted, there's probably not a huge call for this material, but it's a damn shame to let something of such historical signifcance sit idle where no one hears about it. Beerbohm, in fact, posted a note about this on Facebook recently and it was so much of an unknown that someone else tried arguing with him that it wasn't a comic book at all, seemingly only having seen one or two of the illustrations and never getting any context. But for folks like me, who are aware of the book but are unlikely to get many opportunities to actually study it (I've got too much other stuff to go through that's more directly related to my research when I'm visiting a library) a reprint copy would be fantastic to have access to! Hey, IDW or somebody, get on that, would you?